Hi friends! Today's blog post makes me realize that my baby girl is such a BIG girl! We transitioned Olive into a big girl bed when we moved this past March and I realized I never shared it on here. Instead of going with a toddler bed we decided to give her the full bed we had in our old guest room since we downsized from 5 beds to a 3 bedroom home. It just made more sense because we could also use it as a guest bed if ever needed. For Olives room, I knew I wanted lots color. She really does spend a great amount of time in there and I want her imagination to explode. 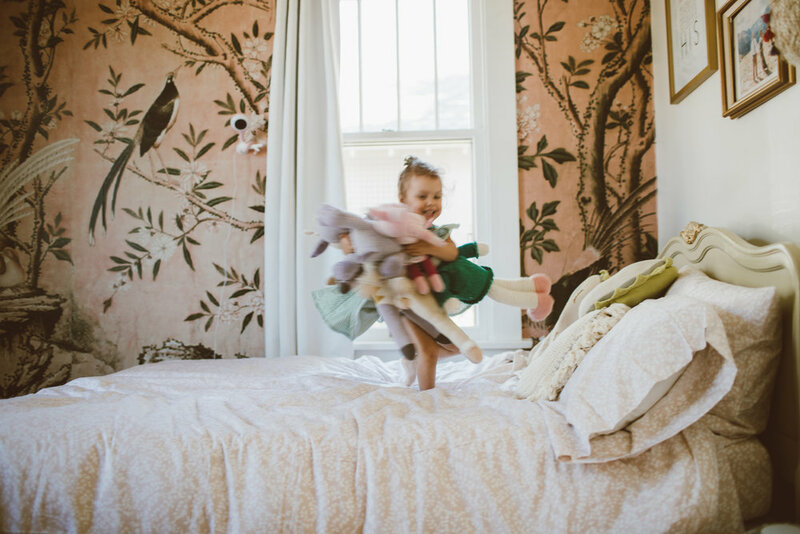 I know right now there is this trend for all white and simple everything but I am drawn to all the pops of color throughout our home and even more so in the girl's room. You may have noticed that with the bedding I chose for our bed HERE. So when it came to Olive's bed I knew I didn't want white but I also didn't want it to clash with her vintage sage headboard. We ended up choosing this really pretty Rose Quarts Bedding from The Company Store. It's has a very light pattern and the color is perfect since Olive adores anything pink. It's so silky soft and we chose to fill the duvet with the same organic down comforter we have in our room. Olive loves to sleep with 100 of her friends and so many blankets so we chose to go with a light fill on the down comforter because it would work for every season. Having Olive in a big girl bed has been the best! Most evenings we all pile in her bed and read books, pray and snuggle before she dozes off to dreamland!